WILLEMSTAD - The Interim President of the Central Bank of Curaçao and St. Maarten, Mrs. Leila Matroos-Lasten gave a presentation to the Curaçao Rotary Club. She spoke about Curaçao’s economy and how to achieve a higher and more inclusive growth path for the island. 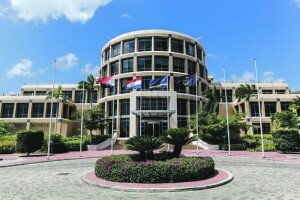 Matroos-Lasten indicated that to assess the effect of trade with Venezuela on the real GDP of Curaçao, the Bank calculated a scenario in which all trade transactions between Curaçao and Venezuela were removed and a scenario in which all transactions with only the Isla Refinery were removed. As Venezuela is one of Curacao’s main trading partners, a discontinuation of all trade will have a negative effect on real GDP, causing a contraction of 5.2% in Curaçao whilst the effect of the closing of only the Isla refinery would mean that the real GDP of Curaçao would contract by 2.5%. Private consumption will drop because of lay-offs, which is a result of a decline in activities in other important export sectors, namely tourism, wholesale & retail trade, and transportation. Meanwhile private investment will drop since no investments will be taking place at the Isla refinery. Public consumption will contract as the government will receive less tax income. Exports will drop and will result in lower foreign exchange revenues due to the decline in the refining fee, transportation activities, tourism activities and re-exports by the free-zone companies. Imports will decline as well, due to a decline in domestic spending, less tourism spending, less free-zone re-exports and no import of goods and services by the Isla refinery. The inflation rate will increase as the non-oil merchandise imports from Venezuela will be replaced by imports from other countries at a higher price. The unemployment rate will rise with 0.5%.